OH~~I translate this article for two weeks and learn a lots info about environment art. It's awesome ! I share this with u. welcome any feedback !! Reference from : VERTEX <--nice web!! The process of creating environments at Naughty Dog is lengthy and detailed, but the real secret is sticking to the fundamentals; both the fundamentals of art as well as the fundamentals of video game pipelines. It’s easy to get ahead of yourself when trying to create whole environments, but there are foundations of environment art that will keep you on track. Here’s an example of modular environment creation with prototypes. This building facade is created with just 4 different prototypes and a minimal amount of non-prototyped mesh. We call this non-prototyped mesh Tfrag. Since Tfrag is only used once, it is a waste of memory whereas prototypes that are instanced multiple times but only load into memory once are much more cost efficient. Obviously some Tfrag will be needed, but being as modular as possible will allow for numerous amounts of detail to be added to the level with a minimal hit to memory. Below are examples of both the Prototypes and Tfrag that were used to create the façade. Working on a game like Uncharted requires a lot of planning and work. It takes a long time to finish an environment, especially with changes in story, design and artistic style. The best way to finish then, is to work iteratively. Taking areas of environments to full completion early on is risky as you’re sure to have to change it sooner or later. There is a process called look development where we will complete a small section of art as a proof of concept to show what each Environment Artist’s vision of their level is, but very little of this is actually used in end results. From there we focus on macro art (the whole environment) and micro art (the detail within the environment). 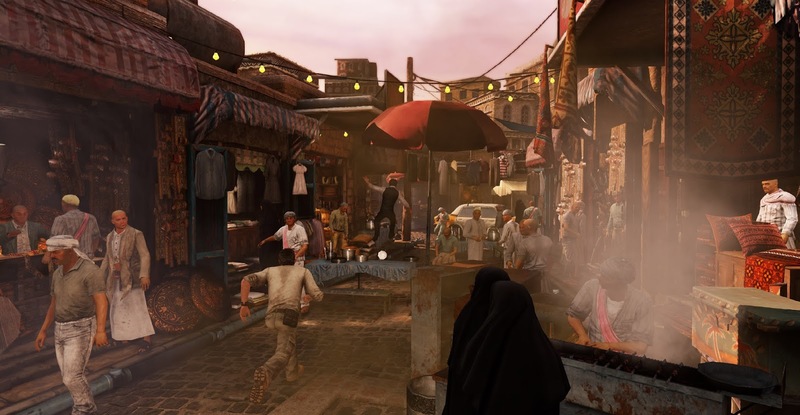 To help explain this, I’m going to use the market from Yemen in Uncharted 3 as an example. After researching and look developing Yemen, the designer then gave me their initial level design in a form we call blockmesh. 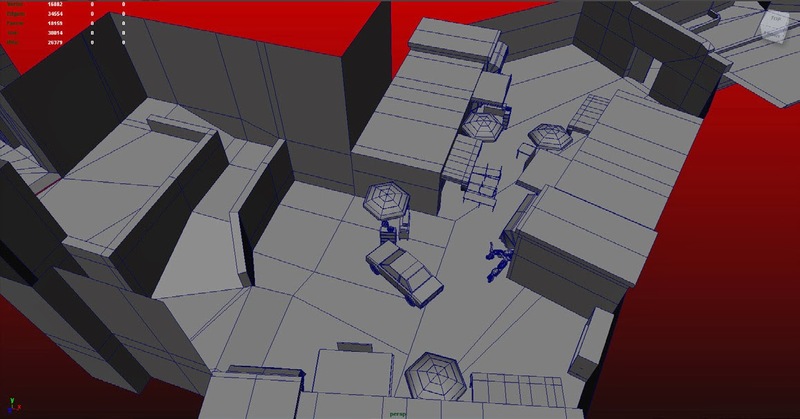 This is just a gray blocky mockup of the level in 3D. After deciding on the look and purpose of each area, I set to work on defining each set in a way that communicates to the player what that space is. In the market’s case, I had to communicate that this was a lively part of the city that people gather to shop, meet and dine. On a macro level, this involved buildings, shops, food vendors, transportation, etc. 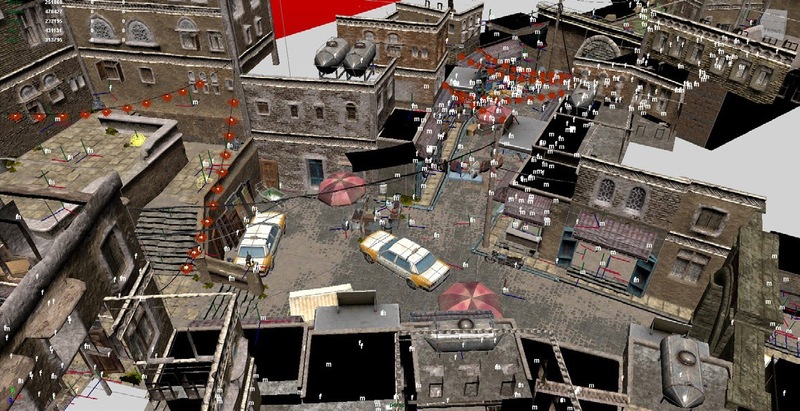 And within such categories, the art is broken down on a micro level to give detail and life to the area. ment styles within a level to be accomplished easier and faster. With the basic setup of the market in place, then comes the fun part: detail. The creation of each environment is heavily dependent upon the game design. 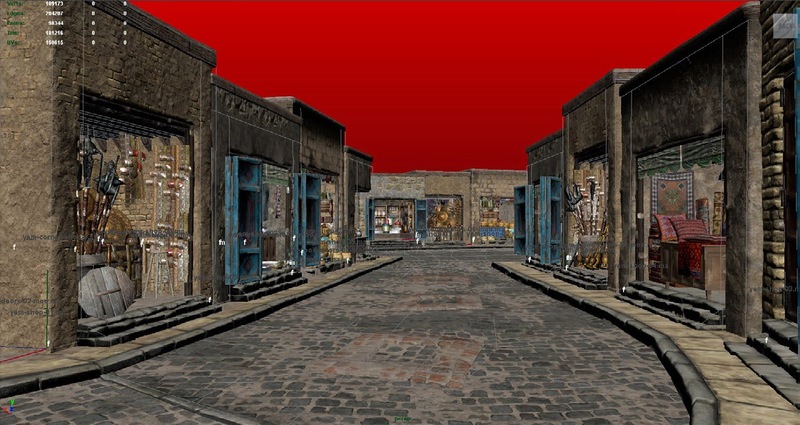 In the market’s case, the gameplay consists of a foot chase which means the player will run past the art quickly and will need as much information as possible without being overwhelmed to quickly make decisions on what to do. The idea then is to give that information to the player quickly and easily to communicate where they are and where they are going. This is where detail is key. 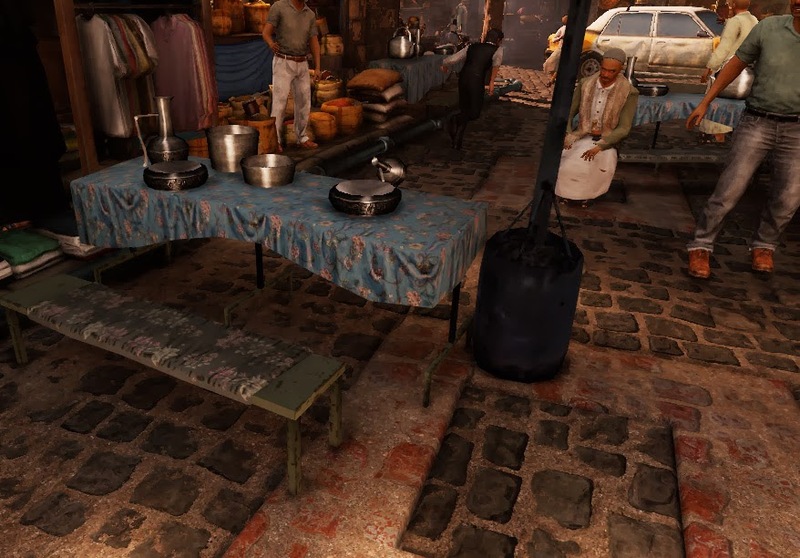 Some of the obstacles in the market are folding tables where the locals eat. To reinforce the design, the tables are adorned with plates, cups, pitchers, bowls and other items. 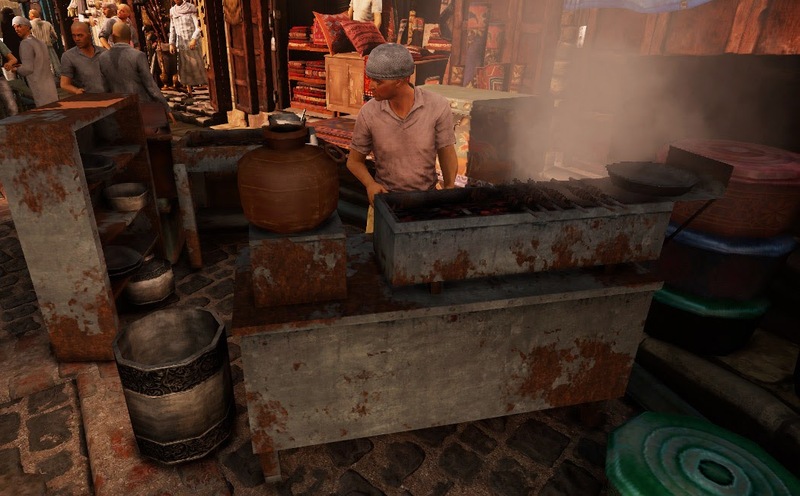 There are food vendors cooking kabobs over charcoal pits with smoke filling the air around them. Next to the food vendors are shelves full of cookware and serving trays. And there are umbrellas and chairs to suggest people sit for extended periods of time here, possibly to dine and talk with friends. While this detail is good in an art sense, it is also good for the design since we want to encourage the player to make the choice of either going around the tables or running over them and knocking all the items off for a more cinematic experience. 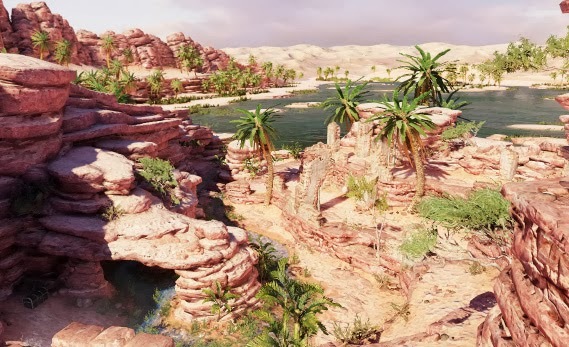 It seems like a lot of work for only about 5 seconds of gameplay, but the job of the Environment Artist is to both capture the player within the world and support game design with hints of detail that serve as communication tools. try and textures get. It’s up to the imagination of the Environment Artist to create a setting and mood with the wide to enthrall the player with a minimalistic amount of detail, just as a painter can imply detail with just simple brush strokes. An important part of the production pipeline that is crucial to talk about it outsourcing. Outsourcing is a huge part of production, and after much trial and error, Naughty Dog seems to have found the best way for us to implement it into our pipeline. Utilizing outsourcing for art helps to keep deadlines on track as well as give the environment artist more time to work on a larger amount of work. 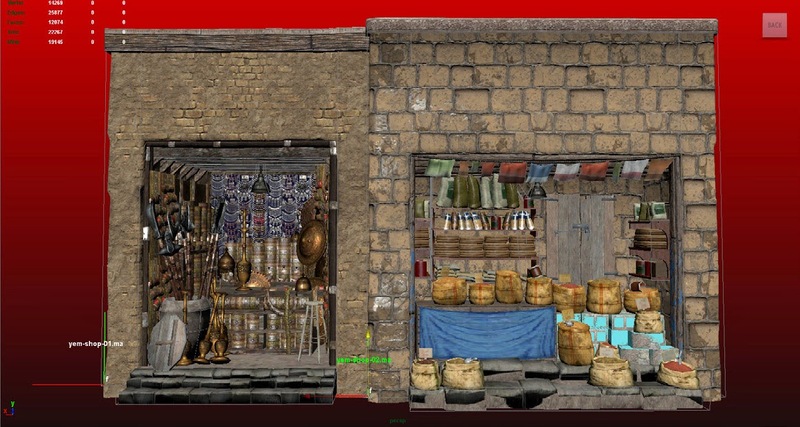 For Yemen, most of the outsourcing was done early on to help visualize the look and after a full library of assets was created, putting together whole levels required very little outsource. 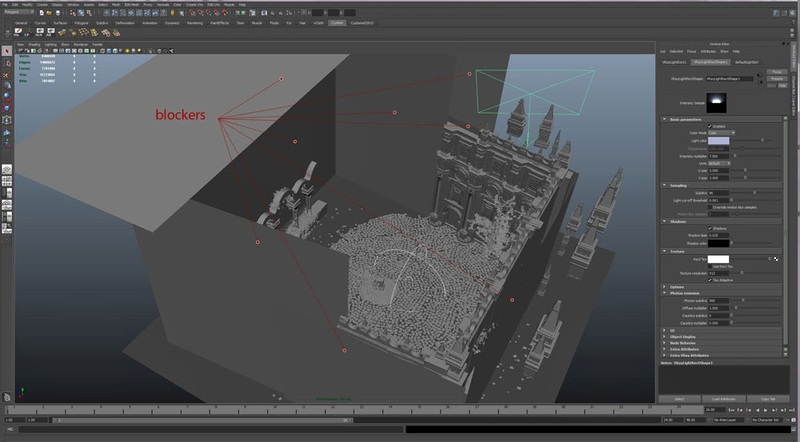 However towards the end of production when the levels were near completion, again outsourcing was used to create the large amount of shadow blockers so that almost no final art casts its own shadow, freeing up frame rate which ultimately allows more final art and detail on screen. A big part of an Environment Artist’s responsibilities is the invisible environment. That is, all the behind the scenes stuff going on that the artist is responsible for that isn’t viewed by the player. These things include collision, shadow blockers, reflection geometry, and sound designation. While all of these are fundamentally basic to the experienced environment artist, a focus on these will enable the maximum amount of final art capable of being rendered in real time. As stated, shadow blockers were helped with by outsourcing, but early in production we decided to make all prototypes include shadow blockers so that through instancing we eliminate the amount of one off shadow blocker art that eats up time of the outsourcers. Collision is created both in prototype and as one offs within a level to suit the needs of the needs of design and also to fix bugs. Reflection geometry is usually low res meshes whose textures are rendered from the higher poly final art that the player sees. Then both geometries are marked to either reflect or not reflect to save frame rate, allowing for real time reflections. 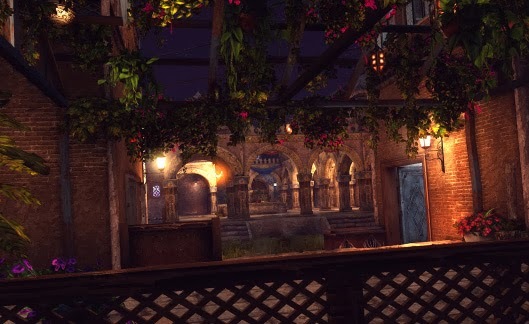 Another job of the environment artist at Naughty Dog is to assign sound information to the collision to dictate what sounds are played when a player walks on or touches it. 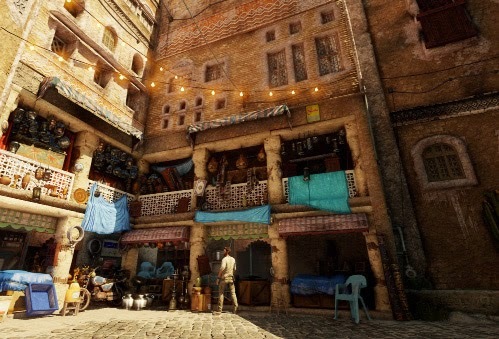 Although this has been just the tip of the iceberg of the environment modeling workflow at Naughty Dog, it is easy to see that so much goes into creating an entire environment from conception to what is shipped in the final version of the game. And although this is the way that Naughty Dog does it, that doesn’t mean it’s the best or right way, but simply what works for us and we are constantly analyzing our methods and improving upon them. It is difficult and sometimes tedious work to fully realize a whole environment but also very rewarding. I often tell people that my job is actually to problem solve and that environment art is the fun thing I get to do for doing that job well. Special thanks to Designer Eric Schatz, Texture Artists Jeremy Huxley and Adelle Bueno, Lighting Artist Eva Krzeminiski and the numerous other talented artists, designers and programmers at Naughty Dog. 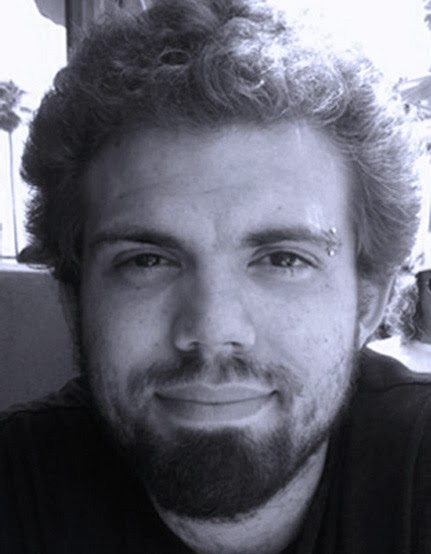 I’m an Environment Artist with 5 years of experience in the game industry. Titles I have worked on include Section 8,Uncharted 2 and Uncharted 3. 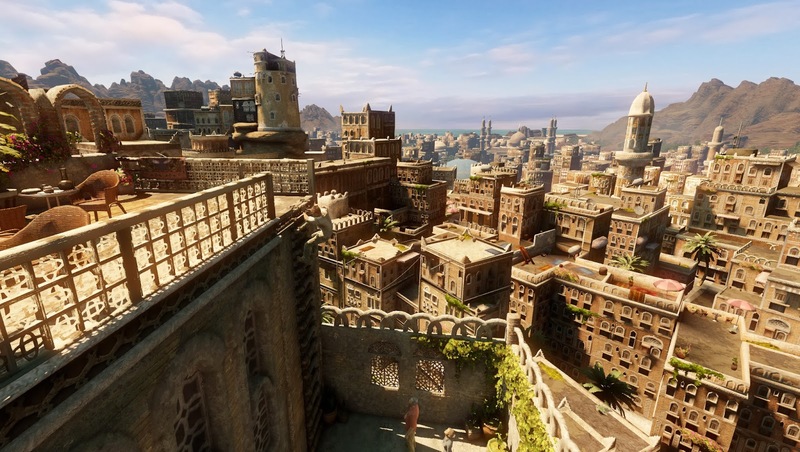 I worked on the train level, over a dozen vistas and a few multiplayer maps in Uncharted 2 and was responsible for the Yemen single player levels in Uncharted 3.